Project Project: 30 in 30: Days 5 and 6 - My breakfast and books. Weekends always throw me off my game. It's OK, though, because we happen to have had a particularly lovely one. No plans, no big accomplishments (although, should Costco on a Saturday count? ), just the three of us relaxing at home. It was a good reminder to me that we don't always have to have Big Plans to have a good time together. Let's be honest, my friends: there are bloggers out there that could turn this challenge into a visual feast for the eyes. I am not one of them. I barely have my eyes open at breakfast time, let alone the ability to get all fancy with my camera. Or my breakfast. For about six days of the week, the North family is a cereal-eating family. You can also tell that Friday morning, when I took this photo, was a winner because I'm eating my cereal with a teaspoon (no clean regular spoons), and we were basically out of orange juice, so I only got half a glass. However, you should also know that the North family eats breakfast together every single day, and that is awesome. Keeping it simple makes that possible, and I'm not trading. My bedside table is crammed with books. Books I've read, books I plan to read, books I'm reading right now, books I like to keep around for reference. I was going to take a photo of that for you, but then realized that I basically already have. And let's be honest, that would also require cleaning and staging said bedside table in order to make it presentable for you. If this blog should have taught you anything, it is that I am a slovenly woman with very little desire to clean. So no. Then I looked beside me on the couch (See? Slovenly.) and saw the books I read every single day. Often multiple times a day. The books that bore me to tears, but that I read over and over again because my little boy loves them so. Which makes me love them too, even if does force me to say things like "Red. Flopsy's cape is red. Turquoise. This shoe is turquoise." Espen loves the page with 8 butterflies, and likes to count them with me. He also likes pointing out the animals and shapes that he knows, and has learned words like 'badger' and 'hexagon' from them. Not bad for 18 months! 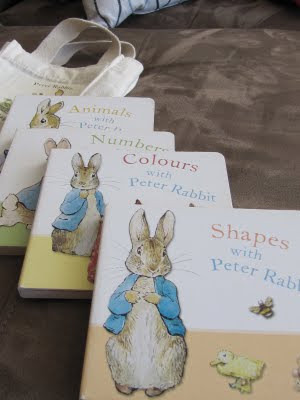 So, if you ever wonder what we might be doing at any given moment, there's a good chance we might be reading our way through 'Peter Rabbit's Bag of Books'. Again.